Susan S. Goode is a community leader, volunteer and devoted advocate for the arts. 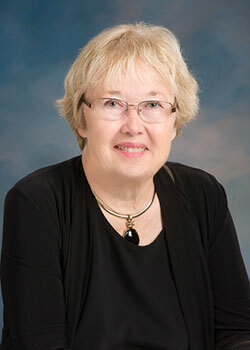 She earned her undergraduate degree in the liberal arts from Duke University, an honorary doctorate from Roanoke College, and holds a lifelong interest in the humanities. Mrs. Goode cares deeply about cultivating the arts in Virginia and ensuring the future of the arts in America. Goode has been an active member of the Virginia Wesleyan University Board of Trustees since 2006. She served as secretary of the Board from 2014-2015 and has chaired its Academic Affairs Committee since 2015. She has played a major role in the revision of the University’s promotion and tenure policy (2007-08); encouraged comprehensive curricular reform (designed from 2007-2011 and implemented in 2011); helped to shape the academic elements in the new strategic plan adopted in 2014 (VWU 2020: Pathway to Prominence); supported the 2013-2015 effort to establish the Lighthouse: Center for Exploration & Discovery, which integrates and enhances the University’s study away, undergraduate research, and internship programs; assisted the University’s successful 10-year reaffirmation of SACSCOC accreditation (2014-2016); and continues to encourage the University’s move into master’s level and online degree programs. She also served a member of the President’s Advisory Council from 1998-2005. In addition to her leadership at Virginia Wesleyan, Goode is on the boards of the Virginia Symphony, Virginia Museum of Fine Arts, Norfolk Commission on the Arts and Humanities, and the Virginia Historical Society. She is also actively involved in the Chrysler Museum of Art in Norfolk. Susan Goode and her husband, David, recognize the critical importance of the arts and believe they are vital to a liberal arts education. In 2013, the Goodes made a lead gift for the construction of a new fine and performing arts center on the Virginia Wesleyan campus. The family’s gift—which is among the five largest in VWU history—launched the planning and fundraising for the forthcoming facility and inspired support among additional lead gift prospects. The Goodes have also invested in Virginia Wesleyan’s science programs through renovations of the University’s math and natural sciences building, Blocker Hall. Their gift helped provide renovated science labs, student access to a research vessel and STEM scholarships. It also ignited growth in the University’s science programs—students majoring in the sciences grew by 111 percent over a five-year period, and biology became the top major, representing 12 percent of enrolled students. The Goodes’ philanthropic philosophy has impact far beyond the capital areas of their giving. They understand that construction and enhancement of facilities signal growth, vitality, and service to the wider community to which VWU is committed. Their support will have a tremendous impact on the University for decades to come. Susan and David Goode reside in Norfolk and have two daughters, Christina and Martha.